My memories of picking blackberries on my grandmother's farm in Southern Maryland have often left me less than enthusiastic about summer berries in California. But last week when we found a vendor at the Marin Farmers' Market with melt-in-your-mouth super sweet blackberries, the time was ripe to indulge in a berry cobbler. Cooks' Illustrated posted a low-sugar blueberry and biscuit recipe with an ingredient list "small enought to let the fruit shine through." I used the blackberries, and switeched out a few ingredients to make the dessert gluten and dairy free. It's peak season for berries. Check your Farmers' Market for the best selection. 4. 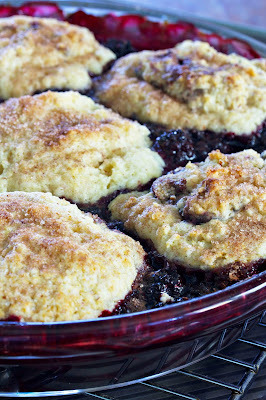 Cool cobbler on a wire rack for 20 minutes and serve. Recipe adapted from the Cooks Illustrated website here.